I arrived in Santa Clara, California a day before the 2009 T.R.A.F.F.I.C. Silicon Valley conference got underway on Monday, April 27. I spent much of that Sunday afternoon thinking about the history of the T.R.A.F.F.I.C. series and the fact that the curtain was about to go up on the 15th edition of this groundbreaking show. Could that really be true!? It seemed like only yesterday that T.R.A.F.F.I.C. 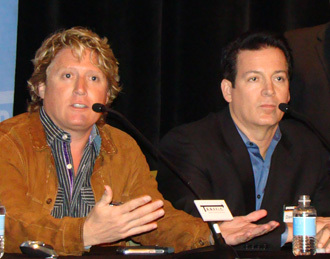 co-founders Rick Schwartz and Howard Neu had staged the first large scale domain conference in Delray Beach, Florida. certainly produced a lot of enjoyable times over the 54 months since the show debuted in a cozy little Marriott on the edge of the Atlantic Ocean. More importantly, T.R.A.F.F.I.C. produced a lot of profitable times for those fortunate enough to attend. That's the bottom line that has tied all of the T.R.A.F.F.I.C. shows together through changing times, formats and venues. To be sure, the glamorous locations and lavish parties provided great memories but meeting the right people and building your business is what this show has always been about at its core. I sensed that at the very first T.R.A.F.F.I.C. 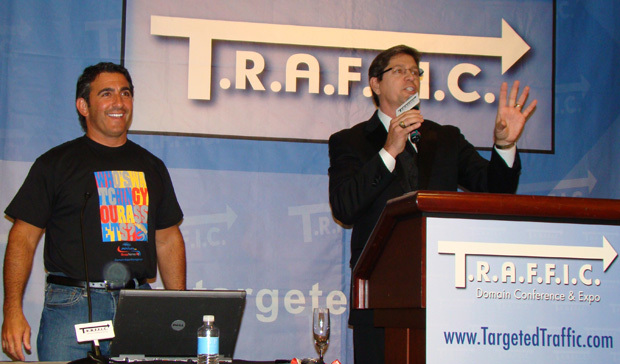 show and in hindsight the headline on our October 2004 review of the debut conference, "Successful Trade Show Heralds the Start of a New Era For the Domain Industry" turned out to be a perfect summation of what T.R.A.F.F.I.C. 's arrival on the scene would mean for this business. A little over a year later, the 2006 T.R.A.F.F.I.C. Silicon Valley show (at the same Santa Clara Marriott where the 2009 conference would be staged) played a huge role in transforming the domain business from a cottage industry into a billion dollar dynamo. The crowd stretched wall to wall at the first T.R.A.F.F.I.C. Silicon Valley show in 2006. T.R.A.F.F.I.C. helped ignite an explosion that made mainstream business coverage of the industry commonplace and led to a long boom that continued until the worst economic downturn since the Great Depression took some of the wind out of our (and everyone's else's) sails late last year (even then, this sector held up far better than others and the domain aftermarket is already rebounding). 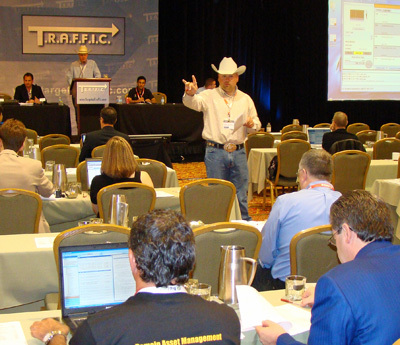 Many new competitors have entered the conference space since T.R.A.F.F.I.C. got the ball rolling (the latest Silicon Valley show was the fourth major conference in a string of six that various promoters are shoe-horning into the first six months of 2009). The pie is getting cut many more ways now, so T.R.A.F.F.I.C., between the surfeit of shows and the slowing economy, hasn't been pulling crowds like the 600 that turned up at T.R.A.F.F.I.C. West in Las Vegas two years ago. The high water mark over the past year was the 350 at T.R.A.F.F.I.C. New York last fall, bookended by the approximately 200 each for T.R.A.F.F.I.C. 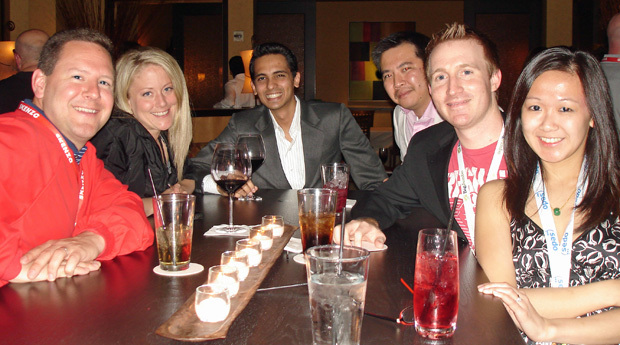 East in Orlando last May and the just concluded conference in Silicon Valley. However, while the quantity of attendees has waned the quality of registrants remains unparalleled and that allowed Silicon Valley to again deliver value well in excess of the considerable cost to attend. 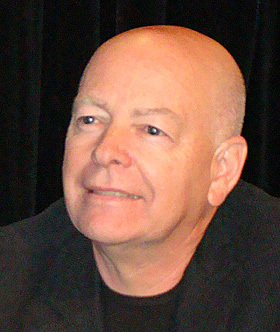 Many who were there, including bloggers Michael Gilmour and Sahar Sarid, have already publicly commented on that fact. 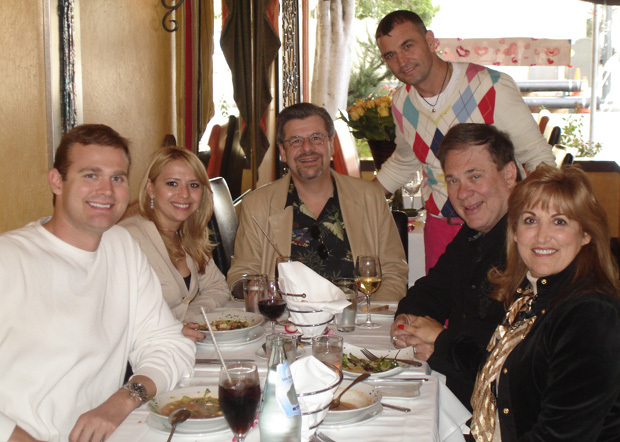 included (left to right): Larry Fischer, Sahar Sarid, Rob Monster and Darren Cleveland. 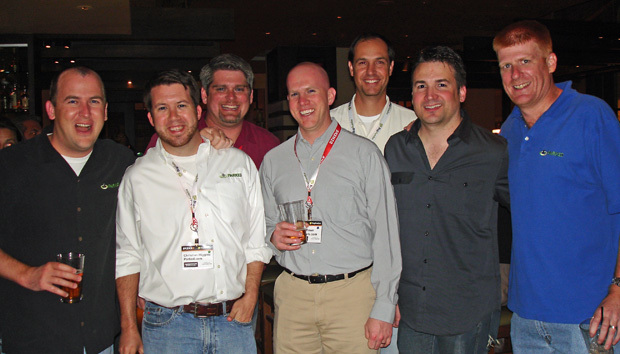 Just a few minutes with a group like that can make the trip worthwhile for any attendee. 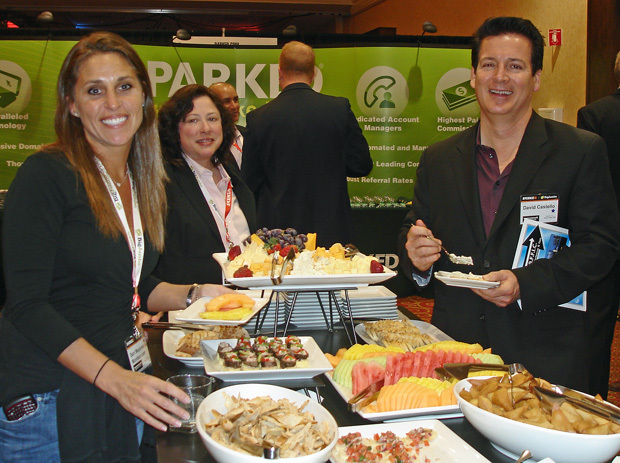 Though smaller crowds are not good for promoters who have to deal with sky high fixed costs, they are advantageous to attendees as you have more opportunities to meet and talk with exceptional people who can have a real impact on your business. You miss making many of those connections when the shows are twice as large. Conferences go by in the blink of an eye and I often come home regretting that I missed the chance to talk with people I wanted to see simply because time ran out. I missed a few this time too, but the manageable size of the crowd allowed me to see the most people possible in the time available. As always, one of the best places to do that was at the opening night cocktail party that was held Monday evening (April 27). NameMedia got the cocktail hour off to a good start with a wine tasting event at their booth. 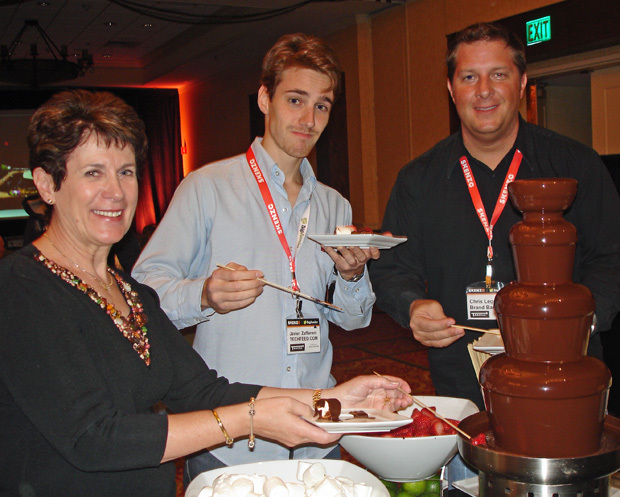 (L to R): Bari Meyerson, Karen Bernstein and David Castello check out the buffet. (the two photos above and first one below are courtesy of Barbara Neu). The first day of business got underway Tuesday morning with a welcoming address from Schwartz and Neu, followed by the conference's first panel discussion. One of the key things I've noticed that is different about T.R.A.F.F.I.C. compared to other conferences is their seminars are often the most lightly attended. Why is that? It goes back to the unique crowd this show attracts. They are the industry's biggest deal makers, so while the informational sessions are going on, many of them are in private meetings or hooking up with each other in the hall to talk business. T.R.A.F.F.I.C. organizers decided it was time to take a new approach to lure some of those people back inside to see what was happening on stage. They did that with an entertaining take off on The Tonight Show - decking out the dais with an interview desk (manned by moderator Howard Neu), plus sofas and chairs filled by guests Rick Schwartz, Divyank Turakhia (Skenzo), Michael Gilmour (Whizzbangs Blog), Joe Casale (Casale Media), journalist Paul Sloan (the author of groundbreaking articles about domain business in Business 2.0 magazine) and Ron Jackson (DN Journal). The Tonight Show setting jazzed up the traditional seminar format. Guests talked about dependence on Google and Yahoo! and potential alternatives. of domain names and domainers. 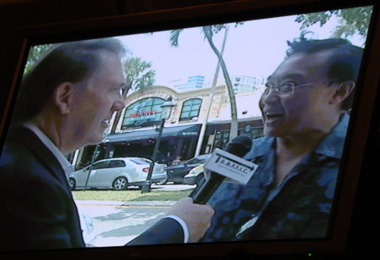 There was even a slick video, pre-produced in Florida, that mimicked Jay Leno's "Jaywalking" segment with Neu querying people on the street to see just how much they knew about domains and what they thought about domainers. The whole presentation was very clever and drew appreciative positive reaction from the audience. This kind of thinking outside the box is exactly what the individual stops on the show circuit need to break the "been there, done that" ennui that was starting to set in among attendees who had seen the same format too many times as the number of conferences multiplied. During the lunch break that followed, NameMedia's Pete Lamson (Senior VP and General Manager of the company's domain marketplaces; BuyDomains and the AfternicDLS) covered trends the company is seeing in the domain aftermarket. He noted that with a small business Internet start up boom underway, their median sales price has been virtually unaffected by the recession in the general economy. Lamson was joined by Brian Carr (NameMedia's Senior VP for Direct Search) who showcased some of the innovative things NameMedia is doing with their SmartName.com platform that marries parking with content and ecommerce options. In a half-hour session after lunch, SEO expert John Andrews (UpperLeftPlacement.com) offered some insight into the mysteries of search engine optimization with an entertaining presentation comparing SEO to magic. John, who also writes a blog at JohnOn.com, has become a popular speaker at industry events because, as a domainer himself, he knows how to explain the intricacies of SEO in language the audience can understand. The day's final seminar was devoted to the future of monetization - will PPC survive or could it be replaced by alternatives like mini-sites or something new on the horizon? The panelists included Michael Gilmour (ParkLogic.com), Donny Simonton (Parked.com), Sahar Sarid (Recall Media Group), the Castello Brothers, Michael and David (Castello Cities Internet Network) and Divyank Turakhia (Skenzo). Michael & David Castello Both Gilmour and Simonton said they had little doubt that PPC would survive and remain a key monetization method and Turakhia went even further saying he didn't understand why people would even ask the question. Simonton drew laughs by adding, "if PPC dies only two people in this entire room will still be here - the Castello Brothers." The Castellos operate profitable businesses on fully developed geodomain websites like PalmSprings.com and Nashville.com, so they have no dependence on PPC revenue. That is a dream many other domainers aspire to achieve. viable allternative to parking, Turakhia said it is almost impossible to make more money from minisites than you can make by simply parking the domain. He noted that studies have shown that when content is added to a page it reduces the click through rate. That being the case you may need direct advertiser relationships on a minisite to offset the PPC drop. Those kinds of relationships are hard to come by for sites that have not been fully developed and attracted a loyal audience. On that point, David Castello added, "There is no half way in development - you have to treat it like a military campaign and go all out." The remainder of the day was devoted to RickLatona.com's live domain auction, conducted by world champion livestock auctioneer Matt Lowery and his crew. The auction generated $375,000 in sales led by Shows.com ($102,000), SmartPhones.com ($95,000) and RemoteControls.com ($32,000). An extended online auction continued for another week and that sale added $186,675 to the till bringing total live/extended auction sales up to $560,000. French.com provided the bulk of the revenue in the extended auction after going for $150,000. 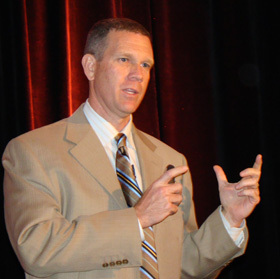 Keynote speaker Scott Klososky an expert in using new technology and trends to boost business. He is very knowledgeable about the domain business as well and he believes that owners of high quality domains are perfectly positioned to take advantage of the changes that are currently turning the media and advertising worlds upside down. The one major caution he had is that by virtue of their failure to band together to protect their own interests, domain owners are in danger of seeing their assets diminished or even taken away by changes in legislation or ICANN policy. 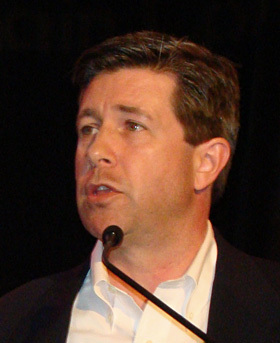 His comments were the best advertisement the Internet Commerce Association could possibly get as they are the only viable organization working to protect domain owner's rights. 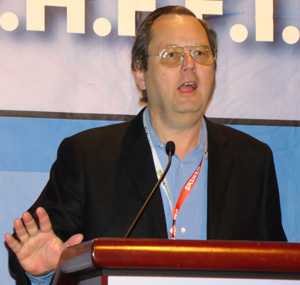 Unfortunately, the ICA has received little financial support from the industry at large and Klososky indicated that could end up being a mistake that will cost domain owners dearly down the road. After Klososky's keynote, attendees were ushered into a fleet of stretch limousines that took them to the popular night club Wet in San Jose for Skenzo's Official T.R.A.F.F.I.C. Party. 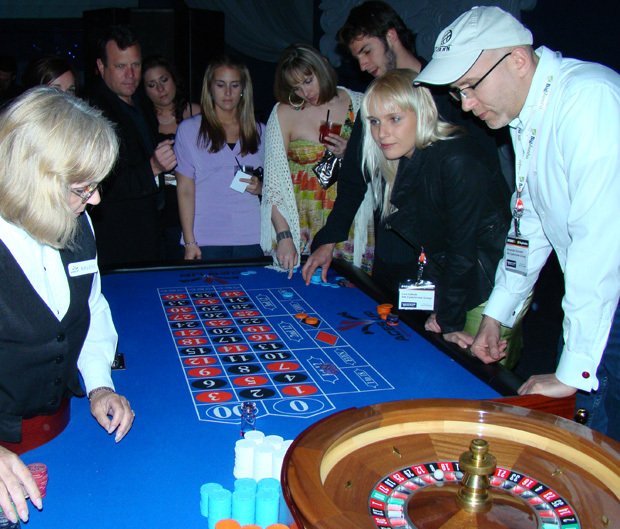 The special casino night theme brought Las Vegas to the Silicon Valley with gaming tables of every kind scattered across the club floor. One of the many gaming tables at Skenzo's casino night party. Ray Neu, would you mind dropping me a note with the name of the cologne you use? After an evening of fun and games, an open bar and endless trays of hors d'oeuvres, those with the most chips were able to cash them in for special prizes. Jothan Frakes (Minds+Machines) goes bonkers after finding out he won a Wii console. wanted to sponsor the Official T.R.A.F.F.I.C. Party at this particular night club. 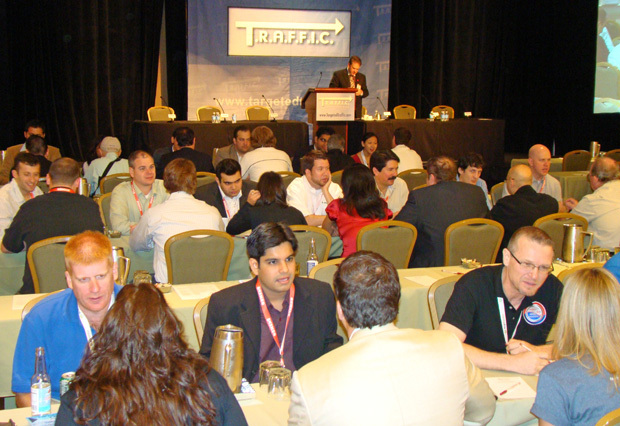 A surprisingly large number of attendees were able to crawl out of bed before noon the next day, undoubtedly because they didn't want to miss the 10am speed networking session that employed T.R.A.F.F.I.C. 's popular musical chairs format. To ensure that everyone in the room connected with the maximum number of people, every couple of minutes one group of attendees moved over a seat to meet someone new, exchange business cards and see if there was common ground upon which they could help each other improve their businesses. In a special treat at 11am, the man who designed the domain name system while still a graduate student at the University of Southern California, Dr. Paul Mockapetris, gave a short talk and then fielded questions from the crowd. In one of many interesting bits of information Dr.
Dr. Paul Mockapetris Mockapetris said the original plan was to have country code extensions only. He added the only reason government officials gave in on the request for a .com global extension was their belief that "nobody will use .com anyhow!" Asked why he, as a grad student, was given responsibility for designing the domain name system, he said "at the time no one thought it was anything important." Dr. Mockapetris said no one envisioned domains becoming the valuable assets they are today. "The marketing people wound up taking over for the scientists and that is when the money came into the game." 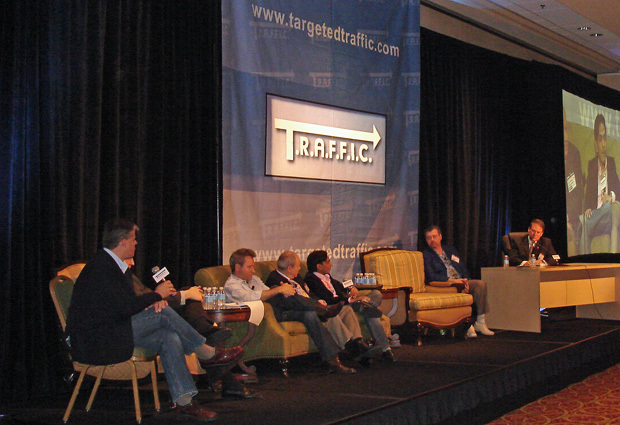 (Moniker.com), Rick Latona and Divyank Turakhia on one side of the podium (separated by moderator Howard Neu) with Larry Fischer (DirectNavigation.com), Ari Goldberger (ESQwire.com) and Gregg McNair (Strata Services) on the other. "Meeting of the Chiefs" session Wednesday morning. This session was originally set up to be a shoot out on various topics between the opposing sides but with the panelists all being good friends, or at least respectful of what the others have accomplished, the affair wound up being a bit too congenial for McNair's tastes. He drew chuckles when he referred to it as "a gondola ride." If you want a straight answer from someone on any topic, McNair is your man. A lot of people won't say what's on their mind for fear of offending someone, but the impossible-not-to-like McNair has the rare ability to not only say what needs to be said, but to say it in a way that makes the cough syrup he doles out taste good on the way down. The mischievous but always amiable Aussie clearly has your best interests at heart. With his long track record of success in multiple businesses, his opinions are also highly valued by everyone who knows him. statistics and quarterly comparisons I covered are available in our latest monthly newsletter that is sent to opt-in subscribers as well as posted online. After lunch it was time for the show's grand finale and its second live auction, this one presented by the originators of the live domain auction format, Moniker.com. This wound up being one of the best live auctions in a long time with $2.1 million in sales being rung up in just over 3 hours. The blockbuster was the $1.4 million sale of Ad.com (purchased by Skenzo's Divyank Turakhia) - a transaction that once completed will be the fourth biggest sale reported so far in 2009. Moniker CEO Monte Cahn and auctioneer Wayne Wheat run the live auction April 29.
after he won Ad.com for $1.4 million in Moniker's live auction. Another $460,000 in sales were rung up in Moniker's extended online auction that continued for seven days after the live event, bringing the total haul to nearly $2.6 million. The top sellers in the extended auction were Diego.com ($58,830), DVDShrink.com ($43,180) and Casco.com ($23,530). Uruguay for the show) & Chris Leggatt go for chocolate covered strawberries & marshmallows. After the auction EuroDNS.com sponsored a pre-dinner cocktail party that was followed by the show's closing dinner. Then Parked.com hosted a show "After Party" in the hotel's Parcel 104 lounge. It was the perfect place to wind down after a hectic week of doing deals, establishing new connections and reinforcing existing relationships. The Parked.com crew welcomed attendees to their T.R.A.F.F.I.C. After Party. 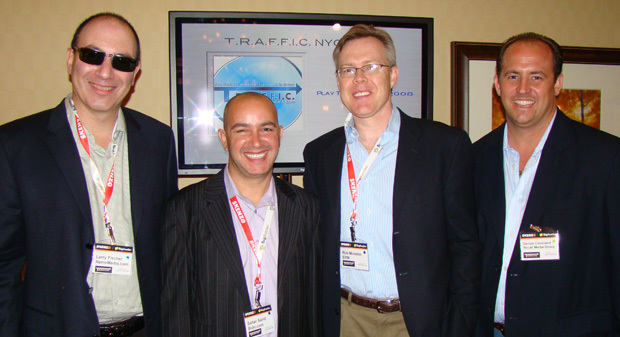 Craig Rowe, David Chavarri, Sig Solares and Monte White. The festivities actually continued well after the "After Party". 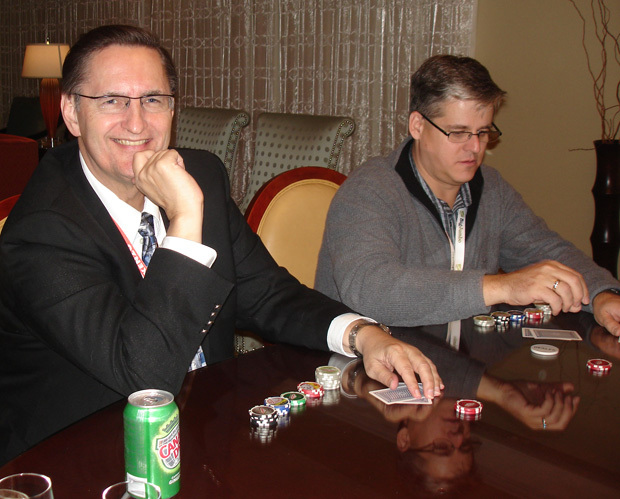 While one small group played poker in an upstairs suite, a larger one gathered just across the hall in Gregg McNair's suite where they continued socializing well into the wee hours of the morning. my travel expenses by getting into a late night poker game with Michael Gilmour. This is what you call a "half baked idea"! (Photo courtesy of Barbara Neu). Most were on their way home first thing Thursday morning (April 30) but I stayed over an extra day to sit in on the T.R.A.F.F.I.C. post-show advisory board meeting that is open to all conference registrants. Show organizers listen to feedback on the just concluded event and suggestions for future shows. T.R.A.F.F.I.C. has two more events coming up this year. T.R.A.F.F.I.C. ccTLDS in Amsterdam June 1-4 (that show will be staged by Rick Latona in a special licensing arrangement similar to the one that saw Fabulous.com put on T.R.A.F.F.I.C. Down Under last November in Australia) and T.R.A.F.F.I.C. New York coming up October 26-29 in Brooklyn. A number of sites and dates are being considered for 2010 but nothing has been finalized for next year yet. restaurant in San Francisco, Allegro Romano, where the owner came over to greet them. Wherever and whenever T.R.A.F.F.I.C. falls on the calendar it seems certain that it will continue to be what it has been on its first 15 laps around the track - the industry's ultimate place to do business.